The method introduced here is a resonance inspection method using mono-frequent pulses which can be generated by a digital signal generator in any frequency windows required. The signal transformation from time to frequency domain, which would otherwise be necessary for the acoustic analysis, is therefore not necessary. Due to the selective excitation of characteristic (diagnostic) frequencies this resonance method is very fast but at the same time more informative than the broadband excitation with the classical acoustic analysis. As this new resonance method can do without any couplant in spite of the piezoelectric sensors, and besides that, it enables to store the test results for every test object as a file, this is the first method to open up the possibility for a complete and low-cost nondestructive testing of mass-produced parts within the production process which can be completely automated. The requirements to be met by the quality assurance of mass-produced parts have changed in line with the new management requirements. Especially with regard to safety-relevant parts, the complete nondestructive testing of all produced pieces is being required more and more, coupled with the demand of documentation of the test results. Since the produced parts are composed of less and less simple component parts, and since they are also partly optimized as to their weight, the volumes to be tested may be very complex. Therefore, the classical test methods consisting of raster scanning of the test object hardly have a chance with this type of components: the inspection takes to long, it is too expensive, if not altogether impossible because of lack of access areas. To make the principle clear and visible we show an Animated Demonstration. The editor. As a solution to these problems we are now introducing a resonance inspection method which also enables automatic testing and sorting of even complex test objects within a few seconds (please also refer to  to ). The classical resonance inspection determines the vibration behaviour of a test object after a impact excitation via a Fourier analysis of the received signals. This is of disadvantage because computing time is consumed for the signal transformation, because a very broadband spectrum is excited which is mostly not required for assessing the test object at all, and because ambient noise often interferes with the signal evaluation. 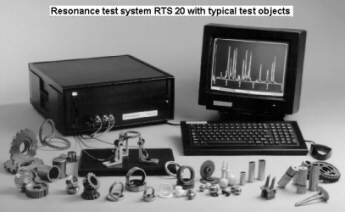 The resonance test system RTS 20 can do without the Fourier analysis (please see Fig. 1). Burst pulses having a precisely defined frequency are used by means of signal generators via a piezosensor to excite the test object. The vibration response is received via separate piezoreceivers. The signal amplitude is stored together with the excited frequency. After that, the next pulse having a higher frequency is emitted, etc., until a predetermined frequency interval (window) is completely scanned. This results in an amplitude-frequency diagram as is shown by the monitor display in Fig. 2. This curve can be stored as a file and further processed, or it can be directly used for computer-assisted decision on the test object. The frequency window can be selected as required in this process. It is also possible to link several windows which do not necessarily have to be interconnected. In this way it is possible to only excite selected frequencies required for characterizing the test object. Only the characteristic lines in the fingerprint of the test object are examined, so to speak. The analysis of the amplitude-frequency curve can be made by means of the most different characteristic features. They only have to correlate with the required properties of the test object. It can be a frequency shift, it can be the number of resonance peaks in a certain window, it can also be the half-value width or the slope of the curve in a certain frequency interval. A guideline for this method is under preparation . This resonance method can be applied to testing of all oscillatory objects made of ceramics and glass, of forged and cast metals and of sintered metals. 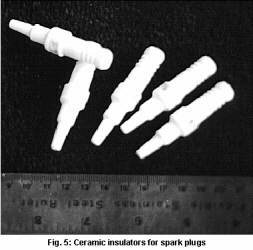 Even jointed ceramic and metal parts, e.g. laser-welded parts, which can otherwise hardly be tested, can be analyzed by this method. The Figs. 3 to 6 show some typical test objects from the mass production in the fields mentioned: a toothed wheel made of sintered metal, forged steering segments, ceramic spark plug insulators and laser-welded cup tappets. The resonance method works empirically, i.e. a learning phase is required to determine the characteristic features of parts showing predefined properties by means of the amplitude-frequency curves which are characteristic of these specific test objects and which are suitable for a reliable sorting (diagnostic frequencies, diagnostic characteristics) in order to distinguish for example cracked components from crack-free ones. However, the density, the dimensional imperfection, the porosity, or the change of the elastic constants can just as well be assessed by means of changes in the resonance. After allocating the parameters of the amplitude-frequency curve to certain properties of the known test objects, e.g. existing cracks, a decision algorithm is set up in a second phase to define the method of automatic testing and sorting of the components. Finally, in the last phase, the task is to combine the evaluation algorithm with the control software and the handling systems to form a functional, fully-automatic test device. The Figs. 7 and 8 show examples of such test stations. Fig. 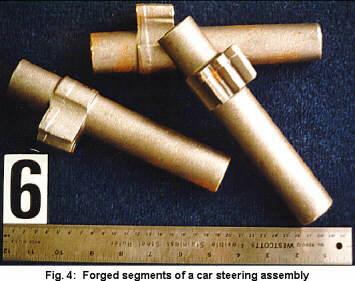 7 shows the semiautomatic testing of the steering elements shown in Fig. 4 which are placed manually. Fig. 8 shows two fully-automatic lines for testing ceramic cones for lambda sondes. Fig. 9 shows the test object, a forged ring-shaped part weighing around 1000 g. With ten parts defined as 'good' and five as 'bad' a frequency window was found in which a resonance shift between the acceptable and the unacceptable objects occurs (Fig. 10). Only this window from 45.8 kHz to 46.8 kHz is required for sorting. The parts can be classified with a cut-off frequency of 46.4 kHz. The lower five curves belong to the defective parts, the upper ones to the flaw-free parts. The fact that most attracts attention is that a part defined as 'good' comes within the sector of the unacceptable objects (second curve from the top). The reason is shown in Fig. 11 where the weight of the test objects is plotted against the resonance frequency determined in the diagram 10. The good parts obviously vary in their dimension tolerances a lot more strongly than the bad parts. However, both groups can be allocated to different linear functions so that it is still possible to allocate the outlier in the bad group to the good parts (with resonances from other frequency windows as so-called predictors). To avoid this, it is of course also possible to make the objects dimensionally more correct. 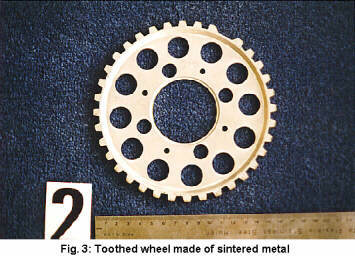 This part made of sintered metal and weighing around 350 g is shown in Fig. 12. 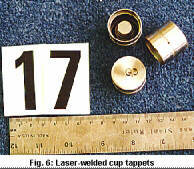 Eighteen parts (of which 14 acceptable and 4 showing unacceptable defects) were included in the learning phase. A diagnostic resonance is shown by the frequency window from 9 kHz to 14 kHz in Fig. 13 at around 10 kHz. The 10 parts having the same properties also show a constant resonance peak. Acceptable objects with overdimension or underdimension, as well as with a changed but acceptable density become noticeable by a frequency shift of this resonance peak. The unacceptable parts having internal flaws or cracks also show frequency shifts. The allocation of the weight to the resonance frequencies according to Fig. 13 is shown in Fig. 14. The groups of the acceptable and the unacceptable parts can be clearly separated - even with work tolerances: the 'good' objects are all situated within the frequency window from 9.7 kHz to 10.0 kHz. The parts with internal flaws are situated below 9.7 kHz. The cracked parts are situated above 10.1 kHz. Editorial: Determining multiple manufacturing defects. Ceramic Industry 144 (1995) 4, 99-101. Schwarz, J.J.; Rhodes, G.W. : Resonance inspection for quality control. Quatrosonics Corporation, Albuquerque USA (1995). Foley, D.F. : Resonant inspection - a promising nondestructive testing option. Metal Powder Report 51 (1996) 10, 18-22. Migliori, A.; Darling, Th.W. : Resonant ultrasound spectroscopy for materials studies and nondestructive testing. Ultrasonics 34 (1996) 2-5, 473-476. American Society for Testing and Materials: ASTM standard guide for resonant ultrasound spectroscopy applied to sorting metallic and nonmetallic parts. Draft 1997. Mr. Schlengermann answers the question "why can a non-contact exiting by lasers be a problem?" is principal investigator in the Application Laboratory of Krautkraemer with over 30 years experience in ultrasonic testing applications. 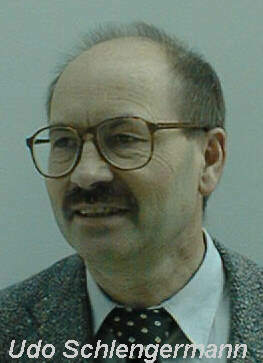 In 1975 he received the Berthold award for outstanding research in the field of transducer's beam propagation. He is also a Fellow of the DGZfP and the DGM. is sales engineer in the Testing Machine Department of Krautkraemer with many years experience in automated ultrasonic testing especially in the automotive and aerospace market.